Lynn "Capt'n Crush" Ray set an Unofficially Long Drive World Record for hitting the most golf balls with a driver indoors for 12 hours... Total of 4801 Balls. 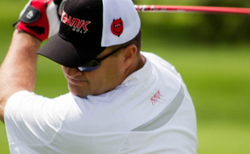 Lynn is training to set a World Record for the most balls hit over 300 yards in 12 hours, at the PGA Farmers Insurance Open at Torrey Pines on January 28 2012. For the San Diego Junior Golf Association. 3 hr 469 On the video Brian made a error on the ball count. 12 hr 341 TOTAL 4801 Balls in 12 hours. 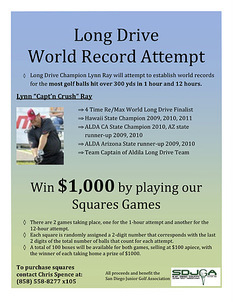 Lynn Ray training for Long Drive World Record. Most Golf balls hit over 300 yards in one hour. Lynn "Capt'n Crush" Ray training to break the World Record for most golf balls hit over 300 yards in one hour and in 12 hours. For the San Diego Junior Golf Association. At the PGA tour event on January 28 2012 at Torrey Pines at the Farmers Insurance Open. There will be two squares games taking place during the long drive record attempt on Saturday, Jan. 28th at the Farmers Insurance Open. Each square will be assigned a random two digit number that corresponds to the last two digits of the total number of balls hit during either the 1-hour attempt or the 12-hour attempt. The winner of each game will get $1000, with no limit to how many squares you can purchase. All proceeds benefit the San Diego Junior Golf Association and we thank you for your participation and good luck!